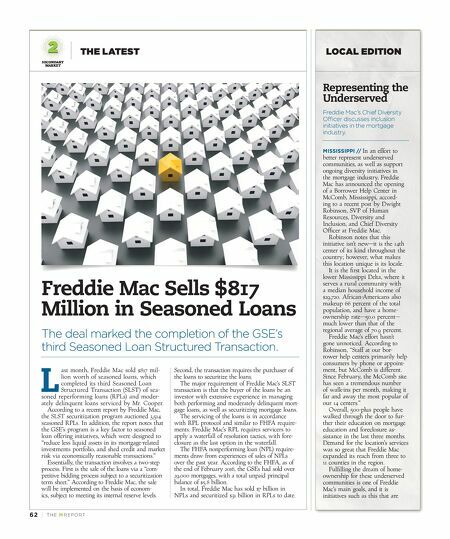 THE LATEST LOCAL EDITION SECONDARY MARKET TH E M R EP O RT | 63 "We believe that the GSEs' attempts to relieve repurchase concerns and expand credit for creditworthy borrowers have contributed to the easing trend." 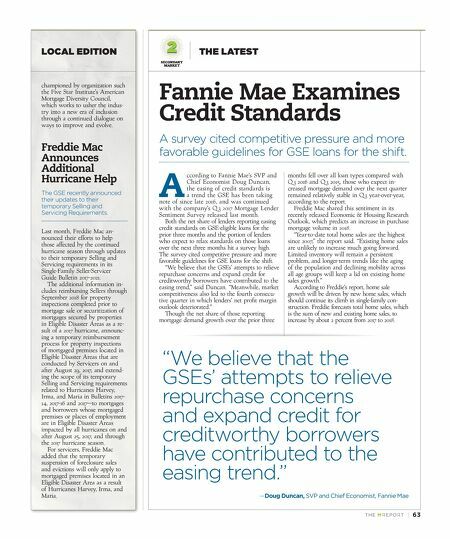 —Doug Duncan, SVP and Chief Economist, Fannie Mae Fannie Mae Examines Credit Standards A survey cited competitive pressure and more favorable guidelines for GSE loans for the shift. A ccording to Fannie Mae's SVP and Chief Economist Doug Duncan, the easing of credit standards is a trend the GSE has been taking note of since late 2016, and was continued with the company's Q 3 2017 Mortgage Lender Sentiment Survey released last month. Both the net share of lenders reporting easing credit standards on GSE-eligible loans for the prior three months and the portion of lenders who expect to relax standards on those loans over the next three months hit a survey high. The survey cited competitive pressure and more favorable guidelines for GSE loans for the shift. "We believe that the GSEs' attempts to relieve repurchase concerns and expand credit for creditworthy borrowers have contributed to the easing trend," said Duncan. "Meanwhile, market competitiveness also led to the fourth consecu - tive quarter in which lenders' net profit margin outlook deteriorated." Though the net share of those reporting mortgage demand growth over the prior three months fell over all loan types compared with Q 3 2016 and Q 3 2015, those who expect in - creased mortgage demand over the next quarter remained relatively stable in Q 3 year-over-year, according to the report. Freddie Mac shared this sentiment in its recently released Economic & Housing Research Outlook, which predicts an increase in purchase mortgage volume in 2018. "Year-to-date total home sales are the highest since 2007," the report said. "Existing home sales are unlikely to increase much going forward. Limited inventory will remain a persistent problem, and longer-term trends like the aging of the population and declining mobility across all age groups will keep a lid on existing home sales growth." According to Freddie's report, home sale growth will be driven by new home sales, which should continue its climb in single-family con - struction. Freddie forecasts total home sales, which is the sum of new and existing home sales, to increase by about 2 percent from 2017 to 2018. championed by organization such the Five Star Institute's American Mortgage Diversity Council, which works to usher the indus- try into a new era of inclusion through a continued dialogue on ways to improve and evolve. Freddie Mac Announces Additional Hurricane Help The GSE recently announced their updates to their temporary Selling and Servicing Requirements. Last month, Freddie Mac an- nounced their efforts to help those affected by the continued hurricane season through updates to their temporary Selling and Servicing requirements in its Single-Family Seller/Servicer Guide Bulletin 2017-2021. The additional information in - cludes reimbursing Sellers through September 2018 for property inspections completed prior to mortgage sale or securitization of mortgages secured by properties in Eligible Disaster Areas as a re - sult of a 2017 hurricane, announc- ing a temporary reimbursement process for property inspections of mortgaged premises located in Eligible Disaster Areas that are conducted by Servicers on and after August 29, 2017, and extend - ing the scope of its temporary Selling and Servicing requirements related to Hurricanes Harvey, Irma, and Maria in Bulletins 2017- 14, 2017-16 and 2017—to mortgages and borrowers whose mortgaged premises or places of employment are in Eligible Disaster Areas impacted by all hurricanes on and after August 25, 2017, and through the 2017 hurricane season. For servicers, Freddie Mac added that the temporary suspension of foreclosure sales and evictions will only apply to mortgaged premises located in an Eligible Disaster Area as a result of Hurricanes Harvey, Irma, and Maria.